I can't figure out how to put more than one picture on the reply. Sounds great... Your gain is much higher than I would expect to work with the short pull on thebar linkage, but that might be due to the larger resistance with the side car.. Have you tried it at slower speeds.. say 50 mph? and I am curious why you used the "manual" setting? Are you not using the neutral switch? It was my understanding from the instructions and talking to Rostra, that the setting had to be "automatic" for the neutral switch lt green wire (for clutch and neutral on the GL1100) to be active... Maybe that is my bad information... Does yours disengage the cruise when you pull in the clutch? Hi sandiegobrass. We have used the cruise control at all speeds. Still need to check it out in different conditions, hills, etc. It has not been harsh or jerky for us.As you know it doesn'tengageuntilaround 35 mph. My son, the first day testing, had the cruise set at 40 mph and decreased it one mile per hour at a time all the way down to about 28 mph before it disengaged. I will be checking this later also. Yesterday after stopping at a stop sign, I accelerated to about 35 mph and hit the resume and the cruise control took us back to 55 mph smoothly. I was on a Parkway in Wichita Falls with the cruise set at 45 mph, speed limit is 45 mph, with stop lights about 1/4 mile or so apart. Theyhave thelights set so that you get green if you do 45 mph from your first red. As you know this doesn't always work so naturallyfor a fewof the lights, I had to slow ahead of time to pick up the green. WhenI hit the resume we accelerated back to 45 mph. The cruise control seems to be working well at all speeds for us. Not much difference operating than in my pickup or the caddie. Very well may be the added sidecar weight. Westarted withthe 'extra low' gain setting on the first day and my son and I decided that the 'low' gain setting was us giving better operation. Now, My Manual Settingwith switch 1 &amp; 2.Allof what I am going to write on this subject you already know, it is for the benefit of others that might be thinking of installing a cruise control and might read this. All of my wiring connections are exactly the same as yours are, 'YOU DID GOOD WORK',exceptpossibly for the grounding point for Ground (Black) wireand theTACH (Dark Blue) wire. Running the Loom over the shock allowed the Ground (Black) wire to be just long enough to connect it to the (over the fuel tank) right cross brace to frame bolt. I also ran the TACH wire back (from the Bulkhead connector) down the loom to ground at the same point, the right cross brace bolt. I could have used the accessorynegativeterminal on themain fuse boxfor groundfor the TACH wire but decidedit would be neater to runback downthe loom andconnect itto the frame. Also a frame ground is not passing through any connectors except the negative battery connection. We have too many wires in the bike front end now: For sidecar-fader controlled radio speakers, brake/tail lights, driving light, air horn, PTT switch, cigarette lighter/light, and headset connector. PO hooked up dash switch for emergency blinkers also. Studied, wrote down,your switch settings. Studied, wrote down,tricky's switch settings. Studied the installation manual. I compared allthree wiring connection write-ups. Tricky didn't use the Light Green Neutral Safety (NSS), not sure why not, but he did hook up the TACH wire to prevent overspeed. You grounded the TACH wire and used the NSS wire.I liked your 5 thoughts on why not to hook up the TACH wire. Inthe Installation Manual, it talks about an automatic transmission andthe nextparagraph talks about a manual transmission. Manual transmission Quote: "On a vehicle with a manual transmission, the TACH wire connection is not required only when CLUTCH DISENGAGEMENT SWITCH (Kit# 250-4206) has been installed." Unquote. I took that to mean that since you andI already havea clutch disengagement switch, NSS wire, hooked up that it doesn't matter which transmission is selected with the #1 and #2 switches. Since our Goldwings have Manual Transmission, I chose Manual. I did wonder why you chose Automatic but I didn't and still don't think it makes any difference. One thing that I still want to check out. On our Goldwings,if in gear, the starter won'tworkuntil the clutch is almost completely depressed. If cruise control is set, at say 60 mph, and you orI pull the clutch slowly, as the clutch plates start to slip, will the engine start to over speed? Our first day of testing, my son mentioned to me that the clutch had to be fully depressed for the cruise to disengage, and that the GL 1500 disengages with just a touch of the clutch lever. I'm thinking, the GL 1500 must have two switches, one for the start function, and another one for the cruise control disengage. Need to look that up, the GL 1500 book is at my son's home. Anyway I am not worried about this sinceI can't think of any timeI would slowly pull the clutch lever while flying down the road, or, anyway that I can get the transmission into neutral at above 33 mph without using the clutch. When slowing from higher speeds, I am always clutching, downshifting, and braking. 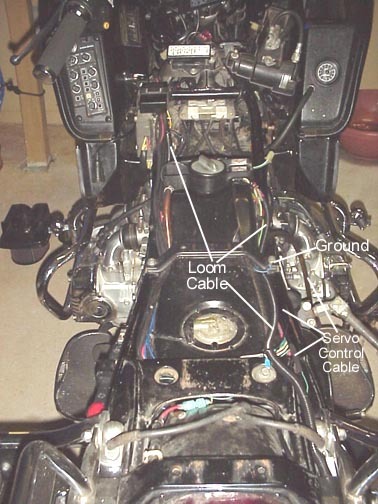 Interesting to see what your thoughts are on hooking up the TACH wire to prevent overspeed. As for me, I am about as happy as a pig in slop! Servo mounting. Geezz, looks a lot like yours! 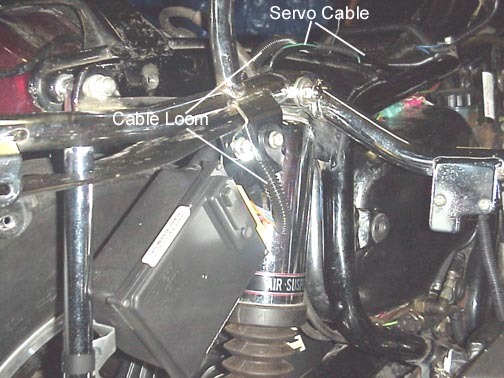 Wiring at fuel tank and air box. Thanks for your pictures... I noticed you custom bracket to support the CPU/Servo unit... Make a few extras and probably someone would buy it.. I have never pulled th clutch in slowly to check.. I'll try that tonight on the way home.. I can't think of a time when I might normally do this either.. maybe slowly out, but slowly in? I do know that the cc will disengage with normal clutching for shifting gears; I've tried that.. give a slight blip in engine speed before disengaging.. And I think that you are correect, there must be two switches in the 1500. Another feature of the 1500 is that forcing the throttle closed will disengage the cruise. In the future, I may add that feature to the 1100 as well... my method willl be to use a spring as part ofmy bead chain connector with a simple elecrical disconnect (inside the spring)in series with the brake lowside wire that opens when the spring begins to extend. 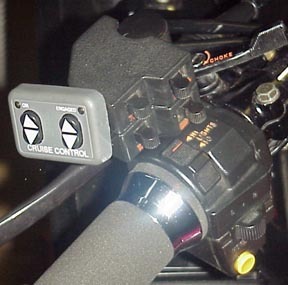 This would allow me to override (and disengage)the cruise with the throttle. "...I have never pulled th clutch in slowly to check.. I'll try that tonight on the way home.. "
I can't imagine any situation where you, me, or anyone else would slowly pull the clutch traveling above 33 mph. I think we are OK with the way you set everything up. 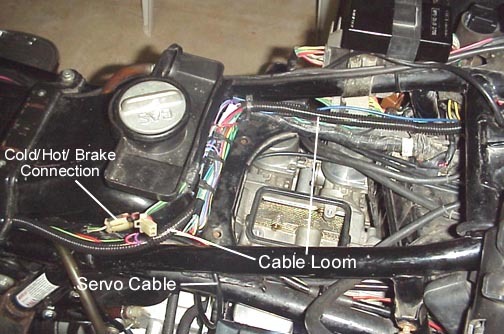 I did check some on the schematics for the GL 1500 Cruise Control. They have disable switches all over the place, one being on the clutch engaging just as you start to pull the clutch. 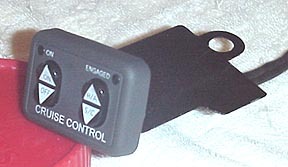 There are two switches at the clutch lever. Also found it works on vacuum, didn't know that. Thanks for everything.